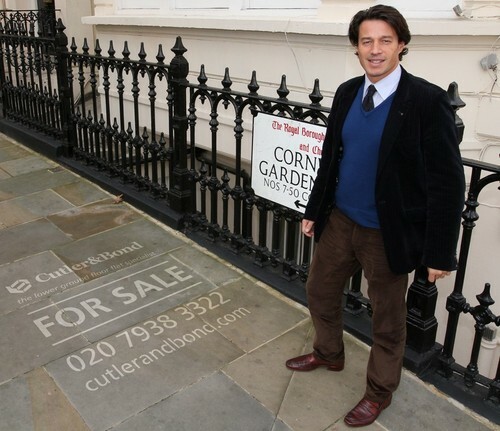 A West London estate agent has solved the ‘For Sale’ sign ban in Kensington and Chelsea by literally cleaning his contact details onto the pavement. Bond (http://www.cutlerandbond.com), came up with the idea as a way of increasing the visibility of properties on his books. The Cutler & Bond signs are created using a stencil, which is laid on the street outside the property for sale. A power washer then cleans the path inside the stencil leaving the ‘For Sale’ message and contact details clearly visible. Being at ground level, the pavement signs are the perfect solution for Cutler & Bond’s exclusive range of lower ground floor properties. Tim Day added: “This is an incredibly flexible and immediate way of indicating that a given property is on the market. Any passer-by who is interested in the property can give us a call, and we can arrange a viewing straightaway. “It’s clean, environmentally friendly and can be washed away instantly once the property has been sold. Cutler & Bond is the only estate agent offering a bespoke service for lower ground floor properties in exclusive areas of Kensington, Chelsea and Knightsbridge. This press release was distributed by ResponseSource Press Release Wire on behalf of Tim Day & Co. in the following categories: Home & Garden, Environment & Nature, Media & Marketing, Construction & Property, for more information visit https://pressreleasewire.responsesource.com/about. Release from Tim Day & Co.